In Moscow, from Wednesday 20 to Monday 25 April 2011, six parishes of the Russian Orthodox Church welcomed Brother Alois, four other brothers of the community and 240 young adults from 26 countries, who took part in the Orthodox liturgical life from Wednesday of Holy Week to Easter Sunday. 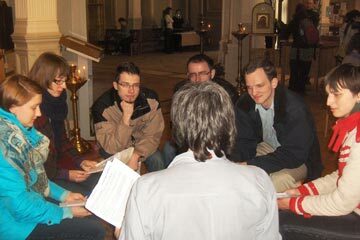 It was the first time that Taizé had led a pilgrimage to Russia. On Holy Thursday, Archpriest Vsevolod Chaplin, president of the Department for Relations between Church and Society, met with all the pilgrims. On Good Friday, all the participants went to Butovo, to the south of Moscow, where over 20,000 people were killed during the Stalinist Great Terror in 1935-36. The Russian Church has made this place into a memorial to the New Martyrs. Many bishops, priests and lay people died there. Saturday morning, the pilgrims were greeted by Metropolitan Hilarion, president of the External Affairs Department of the Patriarchate of Moscow. Saturday evening, they took part in the celebration of the night of Easter in each of the six parishes. The pilgrimage concluded on Sunday with Solemn Easter Vespers, presided over by Patriarch Kirill I in the Cathedral of Christ the Saviour. Today is the last day of the Great Lent for the Orthodox. The weekend, with its feasts of Lazarus Saturday and the Entry of the Lord into Jerusalem on Sunday, already gives a taste of the Easter Celebration. This morning, we took part in the final Liturgy of the Pre-sanctified Gifts - vespers, followed by matins and then a shortened liturgy with the distribution of the gifts consecrated at the last Eucharist. The prayer of St Ephraim is said several times during the service. At the end of each phrase, the congregation crosses themselves, kneels and bows their heads to the ground. This evening was the final meeting for the parish coordinators, in the parish of the Church of the Icon of the Mother of God, Joy of all the Afflicted. Six parishes will welcome the pilgrims. What is striking is their willingness to improvise and welcome all. The coordinators are all young people, and they helping with the blessing of their priest. Their trust is very moving. For most of the parishes, it will be the first time they welcome young adults from other countries. Lazarus Saturday. The raising of Lazarus was the last and greatest of the signs worked by Jesus. It shows him as the giver of life, which paradoxically leads to his death. Both historically and liturgically, it is appropriate that this sign is a prelude to Holy Week and Easter. This morning, liturgy in the church of the Assumption just off Tver Street in central Moscow. It is here where we will welcome the pilgrims on Wednesday. There is a real sense of festivity after the forty days of Lent. As the priest speaks, he reminds us that Christ calls each one of us out of our tombs to bring us to new life already at the present time. The Feast of the Entry of the Lord into Jerusalem – “Palm Sunday” in the West, but “Willow Sunday” in Russia. Spring is almost making an appearance and in the streets stalls with catkin branches can be seen outside the churches. In the metro, you see people carrying these sprigs. It is a form of popular religion. It shows how religious action is no longer alien in what was not so long ago an atheist society. Already last night at Vespers, the priests were blessing the branches, and joyfully sprinkling the congregation with water! Today this is repeated and the churches are full. Everyone holds a candle in their hand. 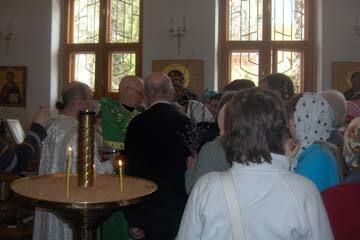 Celebration in a parish church in a village outside Moscow from which the first groups came to Taizé in the early 1990s. Prayer at the grave of the courageous priest who built up the congregation through the difficult years. The sun is shining. It is hard to describe the beauty of this day: one of those special moments when something that so many people have been hoping for and praying for for so long is suddenly fulfilled. 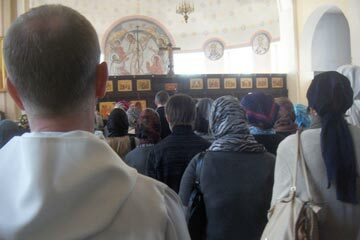 240 pilgrims from 26 different countries welcomed by six different Orthodox parishes in Moscow. Who could have imagined such a thing just a few decades back? The Church of the Dormition, a stone’s throw away from Red Square, wedged between MacDonald’s and the Ministry of the Interior, opened its doors. The presence of the icons in the church, people coming in off the street to light candles before them and praying a moment - all that created a unique atmosphere in which to welcome these young people who have come with the desire to understand something more about the Russian Orthodox Church. An immediate sensation of the peace of heaven on earth, in contrast to the bustle of this vibrant city. What a joy to be among the 300 or so people taking part in the Holy Thursday liturgy at the parish of St Tatyana, the church attached to the Moscow State University, just opposite the Kremlin, at 7.30 am. "Thursday is the day of the institution of the Mystical Supper. In the morning, the liturgy of Holy Thursday is celebrated in every church. On that day, even those who are at work or study try to make time at least for these morning hours to participate in this special liturgy. Once a year, on this day, the prayer “When the glorious disciples” is sung. Everybody receives communion while singing “At Thy Mystical Supper, O Son of God, accept me today as a communicant; for I will not speak of Thy Mysteries unto Thine enemies, neither like Judas will I give Thee a kiss, but like the thief will I confess Thee: remember me, O Lord, when Thou comest in Thy Kingdom”. The whole day is marked by the sign of that special participation in the Last Supper on the eve of the suffering of Our Lord"
After the liturgy, it was time to meet with the 20 or so pilgrims welcomed by the parish. The priest welcomed us all for lunch. Hospitality, even in Lent, passes first of all by the table in Russia! Speaking to the pilgrims, the priest expressed his happiness at their presence and was open for all their questions. In the afternoon, everyone travelled by Metro to the church of Fr Vsevolod Chaplin, President of the Department for Church-Society relations of the Moscow Patriarchate. He spoke first of all of the immense suffering of Russian Christians in the Communist era. Very openly, he told about the challenges facing the church today. "Every Christian must be brave enough to bear witness to their faith wherever they are. The Church is not just for the rich or for the poor - it is for everyone." And he was ready to answer everyone’s questions. Speaking with the pilgrims, everyone is happy. Such a welcome has been given by the families and in the parishes. Despite journey fatigue and the two hours time difference, there were only smiles today. The Russian heart is large indeed. "Evening comes and the service of the Twelve Gospels begins. Everybody is standing with lighted candles. The twelve Gospel passages are being read – from Gethsemane through to the Sealed Tomb. The bell is rung with the number of strokes corresponding to the passage being read from the Passion of Our Lord. In the past, people used to bring the burning candle home from church to light an icon-lamp. This pious tradition is still alive nowadays, though to keep it, if you live a long distance from the church and use public transport, has become more difficult. Those who bring home “the Thursday candle” make a sign of cross with it under the door frame. The candle soot leaves an image of the cross behind." People walking through the streets after the service carrying candles - it all seems so normal here, even if there are others doing completely different things. It’s the first time that I’ve felt the Resurrection already during Holy Week. You can’t avoid it here. The church is being reborn, and people as well. Today we made the trip to Butovo, at the end of the Metro, in the southern suburbs of Moscow. The pilgrims seem no longer daunted by working out the station names in Cyrillic. Everyone was there for 9.45 to catch the bus that took us to the Polygon, at the site of the firing range, where more than 20,000 people were shot during the Great Terror of Stalin between 1935 and 1937, as it is called in Russian. Do we today understand how much Russian people suffered themselves during the Soviet times? Here we were confronted with that reality. At the Church of the New Martyrs, members of the parish were waiting to take us around the site and explain to us what had happened here. Over 1,000 clergy and religious were shot here. The archives of the NKVD show exactly who was killed and when. There are several mass graves, marked by mounds on the site. 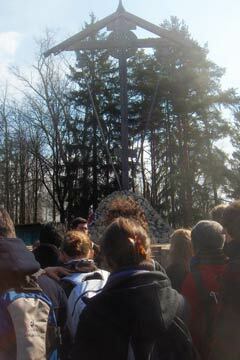 The original wooden church, built in 1995, stands literally on the blood of these martyrs. What a place to spend Good Friday! What a challenge to the way in which we live our faith today. And these were innocents; people who in no way deserved or sought their martyrdom. "And so we reach Friday. On this day there is no liturgy – the Lord himself is nailed to the cross. The day when the Lord died is the most mournful of the year. One can feel it even in the weather, even in nature. But in the depth of the sorrow for the One who died, a hope for the coming Resurrection is hidden. On that day, the service of the Presentation of the Shroud takes place. The image of Christ in the coffin is brought into the middle of the church. The service of burial, the Burial of the Shroud, follows, as the believers process behind the coffin around the church." As we processed out of the church of the New Martyrs singing "Sviaty Bozhe, Sviaty Krepki, Sviaty Byesmyertnikh, Pomiluj nas" (Holy God, Mighty God, Eternal God, have mercy on us) all the pilgrims were able to join in – since we sing this frequently in Taizé. What a force! Different traditions united in song following the shroud of Christ who gave himself on the cross for each one of us. There is the symbol that opens a path for us. And it was as if, coming out of the dark of the church and entering into the light of the evening, we were already entering into the light of the Resurrection. Such was the emotion. This is a time of blessing.